Award-winning metro Atlanta lawn-care company Arbor-Nomics® Turf, Inc., has brought its mascot, a yard gnome, to life and is sending him on the road. 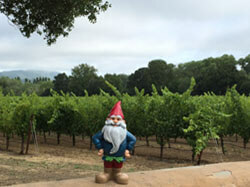 The yard gnome became the company mascot in 2009 and has been featured in billboards, yard signs, brochures and the website ever since. This spring, he came to life in radio spots in which he spoke for the first time. Now, in addition to speaking, he has a name – Gus – and a body in the form of two 11-inch statuettes that will travel with company employees throughout Arbor-Nomics’ metro Atlanta lawn care service areas as well as anywhere else they go, including other parts of the country and the world. Photographs of the gnome on the road will be posted on the company website. The Arbor-Nomics yard gnome, like his legendary European predecessors, lives only in healthy lawns and gardens. Depicted as a kindly little man, he’s a wealth of knowledge about Atlanta lawn care and Atlanta ornamental tree and shrub care and happily shares his knowledge. Taking him on the road will help bring attention to Arbor-Nomics’ Certified Landscape Specialists who keep him happy by making Atlanta landscapes green and beautiful. This summer, besides locations throughout metro Atlanta, Gus is scheduled to travel to California’s Napa Valley, London and Paris.